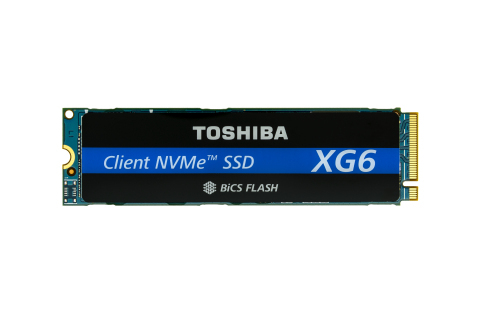 SAN JOSE, Calif.--(BUSINESS WIRE)--Today Toshiba Memory America, Inc., the U.S.-based subsidiary of Toshiba Memory Corporation, has introduced a new lineup of solid state drives (SSDs) that are based on its 96-layer, BiCS FLASH™ 3D flash memory. The first SSD to use this breakthrough technology1, the new XG6 series is targeted to the client PC, high-performance mobile, embedded, and gaming segments – as well as data center environments for boot drives in servers, caching and logging, and commodity storage. Well-suited to a wide range of read-intensive applications that prioritize power efficiency, burst performance and a compact footprint, the XG6 series will be available in capacities of 256, 512 and 1,024 gigabytes7,8. The new SSDs are currently sampling to select OEM customers and will be demonstrated at the Flash Memory Summit in Santa Clara, California, from August 7 – 9 in Hall A, booth #307. 2: PCI Express is a registered trademark of PCI-SIG. 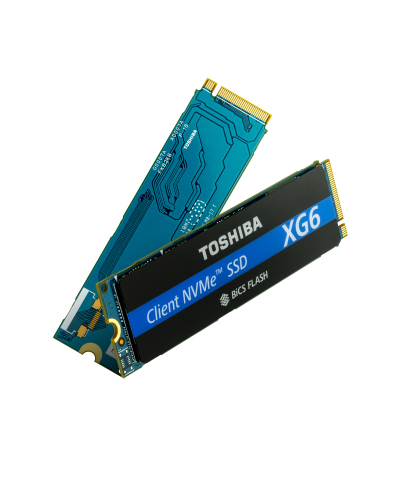 3: NVM Express is a trademark of NVM Express, Inc.
4: Toshiba Memory Corporation survey based on sequential read and write speeds of 128KiB units, using XG6 1024GB models under Toshiba Memory Corporation test conditions. Read and write speed may vary, depending on the host device, read and write conditions, and file size. Toshiba Memory Corporation defines a megabyte (MB) as 1,000,000 bytes and a kibibyte (KiB) as 2^10 bytes, or 1,024 bytes. 7: Definition of capacity: Toshiba Memory Corporation defines a gigabyte (GB) as 1,000,000,000 bytes. A computer operating system, however, reports storage capacity using powers of 2 for the definition of 1GB = 2^30 bytes = 1,073,741,824 bytes and therefore shows less storage capacity. Available storage capacity (including examples of various media files) will vary based on file size, formatting, settings, software and operating system, such as Microsoft Operating System and/or pre-installed software applications, or media content. Actual formatted capacity may vary. 8: Product density is identified based on the density of memory chip(s) within the Product, not the amount of memory capacity available for data storage by the end user. Consumer-usable capacity will be less due to overhead data areas, formatting, bad blocks, and other constraints, and may also vary based on the host device and application. For details, please refer to applicable product specifications. Toshiba has introduced a new lineup of SSDs that are based on its 96-layer, BiCS FLASH™ 3D flash memory.